FIDE congratulates Vice-President of New Zealand Chess federation, Oceania Chess Confederation President and FIDE Zone 3.6 President Mr. Paul Spiller on his appointment as a Member of the New Zealand Order of Merit. Please read more at New Zealand Chess. - Africa: Tshepiso Lopang (BOT), Vice-President of the African Chess Confederation. Their experience and professional knowledge will serve to further develop and promote chess around the world. By virtue of these appointments the four Continental Assistants also become councilors of the Planning and Development Commission, a new body that was created on the FIDE President’s initiative and that will assist national federations in chess development. The King Salman World Blitz Chess Championship concluded today in the Manege, St. Petersburg, with Magnus Carlsen (Norway) and Kateryna Lagno (Russia) emerging champions of their respective sections. After missing the podium in the Rapid Championship, Magnus Carlsen played much better in the Blitz event, holding the top position from the very beginning and securing the gold medal with 17/21 points. This is Carlsen’s fourth world blitz title, having previously won in Moscow 2009, Dubai 2014 and Riyadh 2017. Half a point behind the winner is Jan-Krzysztof Duda (Poland), who has had a powerful run of 8 consecutive victories in the mid-tournament. Hikaru Nakamura (USA) took the bronze medal with 14,5 points, two points behind Duda. Kateryna Lagno (Russia) maintained the good form from the first day of the Championship and emerged clear winner of the Women’s section with 13,5/17 points. This is her second gold medal, the first was won in 2010. Sarasadat Khademalsharieh (Iran) took the silver medal with 13 points. Just like yesterday, she started the day with a loss, but then finished superbly with 4,5 points in the last five rounds. Lei Tingjie (China) claimed the bronze medal with 12,5 points, despite the last round loss to her compatriot Tan Zhongyi. She was fortunate that the main competitor Valentina Gunina was also defeated. The 2nd King Salman World Rapid & Blitz Chess Championships were held from 26-30th December in St.Petersburg, Russia. FIDE and Kirsan Ilyumzhinov have concluded a Settlement Agreement, which was approved by the FIDE Ethics Commission and by the CAS Panel. On 12 July 2018, the FIDE Ethics Commission unaminously decided that Mr Ilyumzhinov is guilty of the violation of art. 2.2.3, 2.2.10 and 2.2.11 of the FIDE Code of Ethics. The FIDE Ethics Commission found that on numerous occasions during the period March 2017 until April 2018, and whilst on the OFAC sanctions list, Mr. Ilyumzhinov acted in a manner incompatible with his duty to put the interests of FIDE above his own personal interests and in defiance of valid decisions of the FIDE Presidential Board by inter alia seeking to exercise powers which had been delegated to the FIDE Deputy-President, seeking to discredit members of the FIDE Presidential Board, making untrue or provocative public statements and refusing to resign following the closure of FIDE’s bank accounts, and in so doing created confusion and instability within FIDE and further inflicted serious reputational, operational and financial harm upon FIDE and brought FIDE and the game of chess into disrepute. The FIDE Ethics Commission suspended Mr Ilyumzhinov from holding any of the positions listed in Chapter 3.1(a) – (l) of the FIDE Statutes for a period of 18 months, of which a period of 12 months are suspended for a period of 2 years (“the period of suspension”) on condition that Mr Ilyumzhinov does not make himself guilty during the period of suspension of any conduct which causes harm to the interests and reputation of FIDE as organisation, its organs, officials, organisers, sponsors and events. The immediately effective suspension was one of 6 months, commencing on 13 July 2018 and ending on 12 January 2019. On 2 August 2018, Mr. Ilyumzhinov filed his Statement of Appeal against the decision of the FIDE Ethics Commission to the CAS. 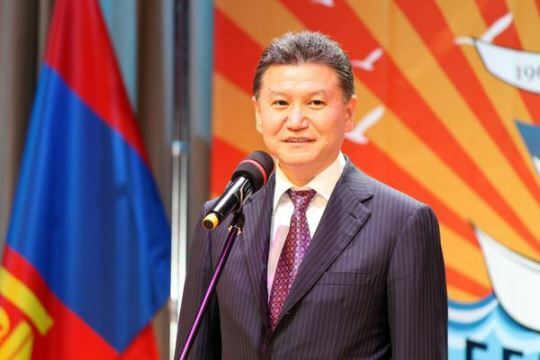 On 21 December 2018, the Settlement Agreement between Kirsan Ilyumzhinov and FIDE submitted to CAS on 28 November 2018 was ratified. According to the ratified Agreement, FIDE agrees to reduce the suspension imposed on Kirsan Ilyumzhinov to a period starting on 13 July 2018 and ending on the day of issuance by the CAS of a Consent Award, ratifying this Settlement Agreement and incorporating its terms into a Consent award. Both Kirsan Ilyumzhinov and FIDE agree that all other aspects of the FIDE Ethics Commission’s decision in the case no 2/208 remain unaffected, ie that the ruling of “guilty” stands. By this Agreement the Russia-dominated FIDE provided some degree of satisfaction to former FIDE President, another Russian, and saved the spending on legal costs. It remains noted that the actions of Kirsan Ilyumzhinov led to the closure of FIDE’s long-standing accounts in Switzerland. Three months after entering office, the new leadership of FIDE is still due to fulfill the election promise and open the bank accounts to re-establish regular operation. Another huge scandal of Kirsan Ilyumzhinov was an attempt to seek re-election as FIDE President by including a fake American “Glen Stark” in his running ticket. This daring stunt was busted by the research of Chessdom.com, which effectively ended Ilyumzhinov’s presidential ambition, prompting the Russian government to bring out a fresh candidate Arkady Dvorkovich and compensate the lost time by providing much greater financial and political support for the elections. The architects of the Glen Stark and other affairs, Berik Balgabaev and Willy Iclicky, were incorporated into Dvorkovich’s team and even awarded the seats in the controversial super-body FIDE Management Board. The winners of the Best Chess Photo in 2018 Contest were awarded in the Angleterre Hotel, St. Petersburg, on December 29. The contest was organized by the Russian Chess Federation together with the Art Russe Foundation. Photographers from Russia, Netherlands, Ukraine, Lavtia, Poland, Greece, and Czech Republic competed in four categories – Children, Game, Amateurs, and Portrait. Anastasia Karlovich won the Children category. Lennart Ootes won both Game and Amateurs categories and was pronounced the absolute winner of the contest. Eteri Kublashvili won the Portrait category. Boris Dolmatovsky received a special prize for his work submitted for the Game. The ceremony was attended by FIDE President Arkady Dvorkovich, RCF Executive Director Mark Glukhovsky, and media representatives. The winners received Grand Cru wine from the limited collection of the Art Russe Foundation. The vineyard of La Grace Dieu Des Prieurs is located in one of France’s most historic winemaking areas: in the Grand Cru vines of Saint-Emilion, which was included in UNESCO’s World Heritage Sites in 1999. La Grace Dieu Des Prieurs was founded in 1885 and today it is surrounded by chateaus such as Figeac, La Dominique and Cheval Blanc. Saint-Emilion wines are thought to be among the finest in the world. In 2014-2017, the Chateau underwent an immense restoration designed to preserve the traditions of French winemaking while combining them with modern innovations, in order to achieve the highest level of wine. To improve this process, the Chateau invited a celebrated oenologist consultant Louis Mitjavile. The architectural aspect of the Chateau was designed by the French architect Jean Nouvel. The Art Russe Foundation has amassed the largest collection of the Russian art of the end in the late 19th and 20th centuries since its inception in 2012. The promotion of the Russian art is one of the main missions of the Foundation. The intention of making this contest traditional was announced at the ceremony. The winning photos and the pictures from the ceremony taken by Maria Emelianova are available in the photo gallery. FIDE publishes the regulations for the 2019 FIDE World Team Championships. The King Salman World Rapid and Blitz Championships ended in the Manege, St. Petersburg, Russia, on December 30. Alexander Zhukov, First Deputy Chairman of the Russian State Duma, made an honorary first move in the starting game of the day, Carlsen-Giri. Magnus Carlsen (Norway) defended his title of the world's strongest blitz player by dominating the championship with 17/21. Jan-Krzysztof Duda (Poland) finished second with 16.5 points. Hikaru Nakamura (USA) took third with 14.5 points. Kateryna Lagno (Russia) won the Women's Section and repeated her success of 2010. She collected 13.5 points. Sarasadat Khademalsharieh (Iran) won the silver with 13 points. Lei Tingjie (China) got the bronze with 12.5 points. The rewards for champions and medal winners of the championships, side event, contest, and trivia winners were given at the closing ceremony. FIDE President Arkady Dvorkovich and His Highness Prince Fahad bin Jalawi bin Abdulaziz bin Mousaad Al Saud, Adviser to the President of General Sports Authority of Saudi Arabia, awarded the World Champions and medal winners of the championships. The players with the best combined score also received special rewards. Magnus Carlsen won the prize in the Open Section, Sarasadat Khademalsharieh got it in the Women's Section. The total prize fund was USD 1,150,000. The King Salman World Blitz Championship started in the Manege in St. Petersburg. The first day started with a moment of silence to Eduard Lvovich Dubov (1938-2018), famous chess arbiter and mathematician. FIDE President Arkady Dvorkovich made a symbolic first move in the Carlsen-Popov game. There were 12 rounds played in the Open Section and 9 rounds in the Women's Section. Magnus Carlsen (Norway) and Vladislav Artemiev (Russia) are tied for first with 9.5 points in the Open Section. Half a point behind are Dmitry Andreikin, Ian Nepomniachtchi, Peter Svidler (all Russia), Jan-Krzysztof Duda (Poland), and Anish Giri (Netherlands). 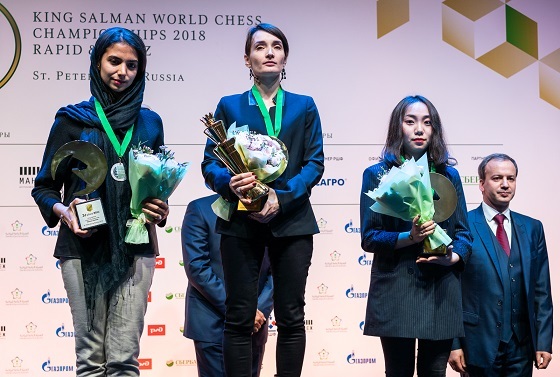 Kateryna Lagno (Russia) and Sarasadat Khademalsharieh (Iran) seized the lead in the Women's Championship with 7.5 points. Ju Wenjun, Lei Tingjie, and Tan Zhongyi (all from China) are half a point behind. The final 9 rounds of the Open Section and 8 rounds of the Women's Section will be played on Sunday, December 30. The closing ceremony will take place on the same day. The rounds begin at 3 p.m.; the games on the final day start at 2 p.m. 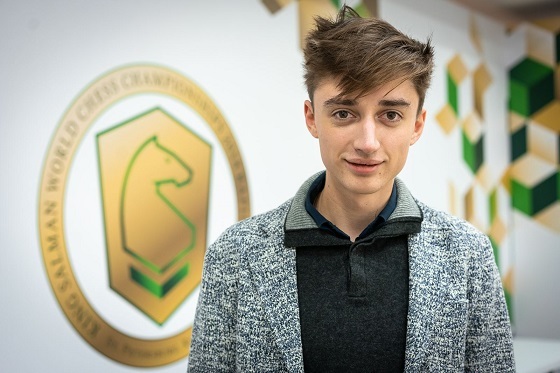 The King Salman World Rapid Championship 2018 concluded today in St.Petersburg with Russian young star Daniil Dubov claiming the gold medal with 11/15 points. The 22-years old, seeded only 25th before the start of the event, completed the race undefeated with 7 wins and 8 draws. The key game was his victory against Wang Hao in the penultimate round which lifted him above the competition. With top seven games of the final round being drawn, the standings did not change and Dubov was set to celebrate a huge success. 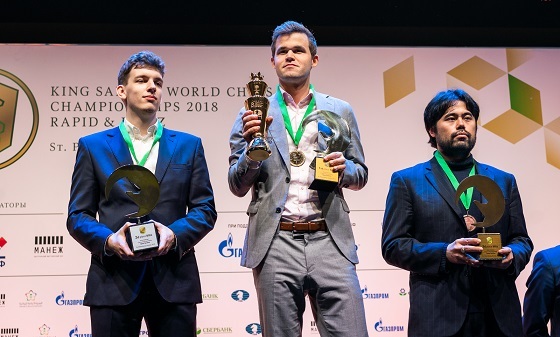 Four players shared the second place with 10,5/15 points each – Shakhriyar Mamedyarov (Azerbaijan), Hikaru Nakamura (USA), Vladislav Artemiev (Russia) and Magnus Carlsen (Norway). Mamedyarov boasted the best tie-break score and took the silver medal. Nakamura followed to win the bronze medal. The reigning World Classical Champion Magnus Carlsen, who actually clinched the last two Classical titles in rapid tie-break games, was unable to secure the podium in the King Salman World Rapid Championship, just like in the previous event in Riyadh. Carlsen paid the heavy price to the shocking losses in the first two rounds, which also ruined his additional criteria in the tie. Carlsen lost 34 elo points, but he can still improve the impression if he does well in the upcoming King Salman World Blitz Championship, where he will defend the title. The best placed Arab player is GM Salem A.R.Saleh with 9/15 points. Saleh was actually in superb shape, having defeated Ian Nepomniachtchi in the 13th round to share the 3rd place, but the losses in the last two rounds deprived him of better finish. Ju Wenjun’s gold medal in the Women’s Rapid Championship was never in doubt as she assumed the lead from the very start of the event and cruised to convincing victory with 10/12 points, leaving the nearest followers a full point behind. This is her second title in the King Salman Women’s World Rapid Championship as she had also won the previous event in Riyadh, Saudi Arabia. 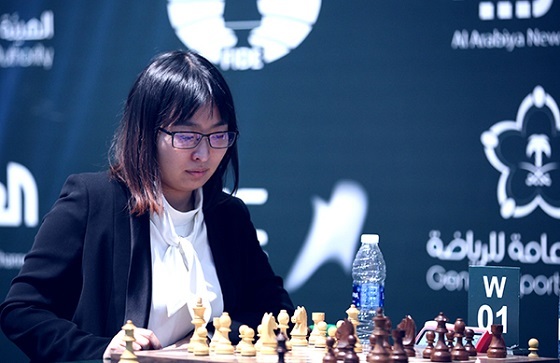 Being also the reigning World Classical Champion, the Chinese has the chance to unite the titles in all three formats if she wins the King Salman Women’s World Blitz Championship. On the shared second place are Sarasadat Khademalsharieh from Iran and Aleksandra Goryachkina from Russia with 9 points each. Khademalsharieh claimed the silver medal on better tie-break, while Goryachkina took the bronze. Khademalsharieh suffered a setback in the second round by losing to the talented Bibisara Assaubayeva, but a great start of the final day of the Championship, when she defeated former World Champions Antoaneta Stefanova and Mariya Muzychuk, secured a strong finish. Goryachkina was close to the top throughout the competition, however a loss to the eventual winner Ju Wenjun in the 10th round meant that she had to go all-in in the final two rounds. Goryachkina succeeded and with two wins finally captured the medal. The King Salman World Blitz Championship starts tomorrow. FIDE and Mr. Kirsan Ilyumzhinov concluded a Settlement Agreement, which was approved by CAS. New leadership of FIDE is happy to announce that a Settlement Agreement between FIDE and former FIDE President Kirsan Ilyumzhinov has been reached. Below is detailed information about this case. On 12 July 2018, the FIDE Ethics Commission determined that FIDE President Kirsan Ilyumzhinov be temporary excluded from his office for 18 months with effect from 12 July 2018, 12 months of which were suspended for a period of two years. On 27 November 2018, the Parties reached an amicable settlement of their dispute. In the process of preparation of the Agreement from the FIDE side, the draft of the Agreement was reviewed and approved by the FIDE Ethics Commission. Furthermore, the idea of the settlement was also approved by the FIDE Presidential Board (the decision of the Board Q4PB-2018/50). FIDE would like to emphasize separately that the above agreement was subject to ratification by the Panel of independent arbitrators of the CAS that reviewed it. According to the ratified Agreement, FIDE agrees to reduce the temporary exclusion imposed on Kirsan Ilyumzhinov from holding any of the positions listed in Chapter 3.1. (a)-(l) of the FIDE Statutes to a period starting on 13 July 2018 and ending on the day of issuance by the CAS of a Consent Award, ratifying this Settlement Agreement and incorporating its terms into a Consent award. Both Kirsan Ilyumzhinov and FIDE agree that all other aspects of the FIDE Ethics Commission’s decision in the case no 2/208 remain unaffected. FIDE would like to emphasize that this Settlement Agreement constitutes the full and final settlement of the dispute between FIDE and Kirsan Ilyumzhinov relating to the FIDE Ethics Commission’s decision in the case no 2-2018. Furthermore, Kirsan Ilyumzhinov confirms that he does not have any claims against FIDE not only in connection with the present dispute, but also in the framework of his entire relationship with FIDE".